We had a whirlwind week in Maui. 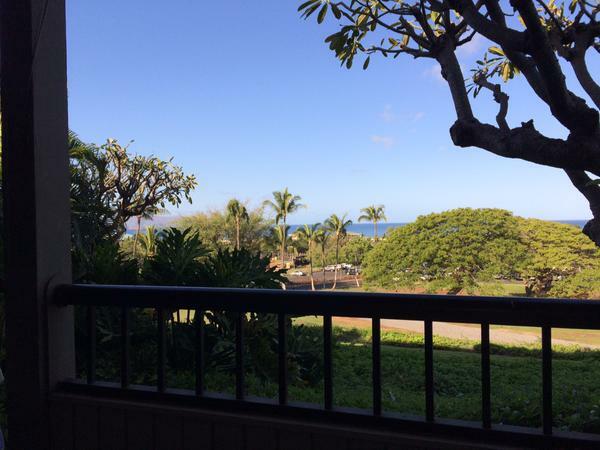 Ocean view from our lanai! A wedding. Swimming. Meltdowns. Beach. Whales. Food. Sand. Leis. All of the above were part of our week, but none of them does justice to our time there. We hit the ground running and didn’t stop for several days. We did go to the beach after about three days and it was heavenly. I’m not normally a morning person, but for some reason, I can wake up early in Hawaii and enjoy it. I know it’s probably the time change, but even after a few days, I was falling asleep at 11:00 instead of 8:00 but still waking up around 6. I love that about me in Hawaii. At this time of year, the humpback whales are in Hawaii to give birth and breed. We love being on the water and watching them. We love sitting on the beach and watching them. We love sitting on the lanai and watching them. Basically, anytime we have an ocean view, we’re looking for whales. To the right is a picture I shot from the deck of the boat on which we took a whale-watching excursion. It’s a calf, about to try to breach (when the whale throws him/herself out of the water, spins, and lands). We saw many of these baby breaches and a few large breaches. We came home happy and exhausted. And looking forward to our next trip. Whenever it may be.